Kick back and relax at our most unique, inviting, fully renovated bed and breakfast nestled hillside amidst the evergreen trees. Offering 5 luxurious rooms and many guest amenities, including a fresh hot breakfast, to help make your stay a most enjoyable and memorable one. A premiere Jackson Hole Wyoming Dude Ranch. Hike the mountains. Ride the wilderness. Fish a legendary trout stream. Dine outrageously. Nearest neighbor – 10 miles away. Built by a countess and a cowboy in the 1920s. Elegantly appointed, lovingly restored. One of Jackson Hole, Wyoming’s most luxurious and historic guest ranches – for couples, families, fly fishing parties, hiking clubs, once-in-a-lifetime gatherings. Located in the heart of Jackson, our luxury boutique property boasts one of the most premium locations mist all Jackson Hole properties. Numerous amenities and eccentric guest services make The White Buffalo Club truly one of the best lodging options Jackson has to offer. Nestled next to Flat Creek, the Inn on the Creek is renowned for its charming setting, friendly service, delicious breakfasts, and affordable luxury. The newest in luxury lodging rests in the heart of Jackson Hole. The comfortable rooms, in a modern Western style, provide the perfect accommodations for relaxation, adventure, and anything in between. Situated in the heart of downtown Jackson, Hotel Jackson redefines the art of Western hospitality, providing an extraordinary luxury, boutique hotel experience. LEED-built, it is the town's only Forbes four-star, AAA four-diamond and TripAdvisor Travelers' Choice award-winning property. Family owned, the upscale lodge-style hotel is just a 5-minute walk to the Jackson Town Square. Featuring rustic-chic accents, relaxed rooms and suites offering flat screen TVs and free Wi-Fi. With 140 rooms and suites, extended continental breakfast, outdoor hot tub, indoor hot tub, indoor swimming pool, fitness room and 2 conference rooms, the 49'er Inn can accommodate all of your lodging needs. Just 3 blocks from the town square. 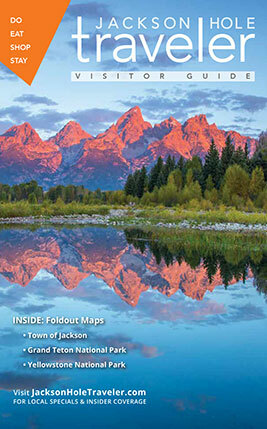 Located in the heart of Jackson Hole & Grand Teton National Park. Offering an unparalleled horseback riding experience and one of the most complete outdoor recreation packages of any facility in the Mountain West.